Aristotle's unities were adopted as a rigid form of construction for dramatic arts — theater, and then later film — stipulating that action in a play should take place within one location, with one plot that follows minimal subplots, and within a 24-hour period. 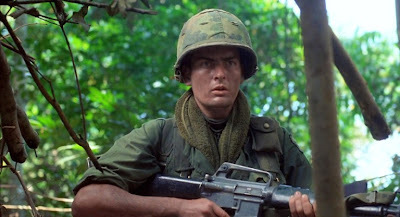 With drama, it is naturally easier to do this than a film, a medium begging to push the envelope of those boundaries, but what's striking about Oliver Stone's Platoon — one of the more deserved winners of the best picture Oscar released 25 years ago today — is that it pretty tightly restricts itself to two of these unities, those of location and of subject. Even if it violates the third, that of time, the swirling, nightmarish reality of war that this takes place in feels like one uninterrupted sequence. That focused approach does more to reveal the tragedy of America's involvement in the war than other sprawling films that move from location to location, shift from one decade to the next, without maintaining the spotlight on a limited scope. Little events inform big events and, as any good English teacher would tell their students, showing rather than telling straight-out is more effective. By examining the mental development (or deterioration) of the main character, Chris Taylor (Charlie Sheen), more is said than any film that would tell the story with a more bombastic, didactic approach. That's all the more surprising considering the director, Oliver Stone, who pretty much defines bombast when it comes to Hollywood (OK, there's Michael Bay, but let's stick with serious directors here). Perhaps it's because Stone focuses on what he knows — the journey of a grunt through Vietnam over a period of months — that helps the movie maintain perspective. The societal rot depicted in the lives of these soldiers mirrors the loss of the country's moral decline when it comes to justification for the fight. 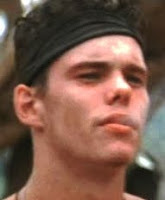 Viewers will come to recognize the justification for further bloodshed through the words of several characters, notably Bunny (Kevin Dillon, in his pre-Johnny Drama days), vowing revenge on unnamed Vietnamese who have slain one of the soldiers of their platoon. Such rationale for more destruction was present late in Vietnam and certainly throughout the recent campaigns in Afghanistan and Iraq — that somehow, the loss of life by Americans justified further loss of life by others, that is, the "eye for an eye" approach. High-minded, moral reasoning that accompany such well-intentioned efforts (it's not for no reason that Sheen's character is college-educated, and has enlisted more to do the right thing than for any other reason) eventually breaks down, leaving the baser elements — vengeance, bloodlust, a self-fulfilling circle of violence predicated on giving back punishment. One could say a clear-headed view of war would recognize when too much blood and treasure has been given in service of an effort that is no longer necessary, but America's involvement in Vietnam lasted for several years after the events of this movie, and our troops are finally just leaving Iraq after nearly a decade, still accompanied by the cheerleading from those who would continue to justify more killing in service of an elusive utopia. Much of what Stone presents in this fashion is understated. The greater political factions that exist behind the war are not presented — the action never leaves Vietnam and specifically follows the one platoon in the months leading to the 1968 Tet offensive, the results of which went a great distance toward changing American opinion about the conflict. There's no attempt to draw a greater lesson from poor decisions among higher leadership, save for the feckless Lt. Wolfe played by Mark Moses (who would go on to play another sad sack as "Duck" Phillips in Mad Men). The difference between those who believe and those who don't are presented in stark fashion, between the weary, once-motivated Sgt. Elias (Willem Dafoe, in a great, understated turn) and the gung-ho, scarred Sgt. 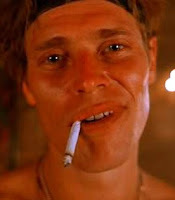 Barnes (Tom Berenger, a performance of such intensity that it overshadows every film he's made since). Elias smokes marijuana to escape the pain of this conflict, and counts a number of allies within the platoon as the squad splinters. He's forced to intervene to stop the killing of a young Vietnamese woman, and serves as the conscience of the platoon, the superego to Barnes, all rage and desire. This can be seen as a parable for America, certainly, but if the movie only worked on an allegorical level it would be a failure. Thankfully the rhythm of the action between the characters, and the enveloping fear of dread that surrounds the cast offsets these impulses. If Stone makes one mistake, it's to rely too much on narration that does cross into a more heavy-handed exposition, notably the last lines where Chris says he often feels like a child "born of those two fathers," those being Barnes and Elias. The images are powerful enough without the voiceovers, and indeed it works best, and most powerfully, at those moments — consider the way Elias's expression changes when he realizes Barnes is going to shoot him, or late in the film when Barnes, wounded, picks up a trenching tool to bludgeon anyone he sees, or the crushed look on the face of Sgt. 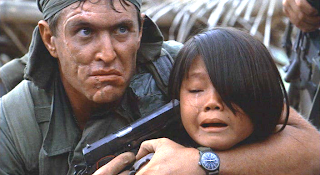 O'Neil (John C. McGinley, a Stone regular) when he's assigned the platoon after Barnes' death. If this all sounds dreary to the point of being unwatchable, it's not, thanks to a varied, lively group of supporting actors that include Forest Whitaker and Johnny Depp in early roles, engaging performances from Keith David as King and the late Francesco Quinn — son of Anthony Quinn — as Rhah, and the aforementioned Dillon and McGinley. They bring the subject alive in a way Terrence Malick's The Thin Red Line flounders in part because of his decision to cast actors largely devoid of personalities (Nick Nolte, John Cusack and Elias Koteas excepted). Unfortunately, later in his career Stone stopped trusting the images to tell his story, larding up his films with cinematographic technique that often feels pulled from a Tony Scott film — switching from black-and-white to color, extreme close-ups, blurry imagery — and even more portentous narration. Natural Born Killers is the worst offender in Stone's catalog, but the seeds were there in JFK, which tries to will the viewer through misdirection and fancy editing into believing that everyone from the armed forces to Lyndon Johnson to the Mafia assassinated the president. The Vietnam film had a steady run in the late 1980s, as this was followed by Stanley Kubrick's acclaimed but uneven Full Metal Jacket, Casualties of War and less successful films such as The Hanoi Hilton and Hamburger Hill. Stone returns to the subject again with Heaven and Earth, another movie that tries to do too much despite strong performances. His feature films largely have failed to ever get back on track (though W. had its moments), but Platoon remains one of the strongest, most affecting movies from the 1980s.